We are about to be grandparents, by the time you read this we might be. As of Feb 21 at 7PM the daughter in law was having contractions but not progressing. This is our first grandbaby, sorta and stop trying to do the math. I have no children of my own, my husband who is older than I am does. His son married a woman who had two children and this is their first child. See, we are the very definition of a blended family. So while none of the people share my DNA they are all mine and I'll argue with anyone who says differently. So, yes we are grandparents already and yes we are having our first grandchild. Yep, I'm going to be a 30 something grandma and I love it. No, I didn't make the quilt, my husband did. It was his idea to make this the quilt, that quilted us all together. This post may contain affiliate links, buying from my links cost you nothing and puts a few pennies in the fabric budget. Thank you for the support. There's no real design to the quilt here. It's just little squares arranged how my husband liked. We went to a garage sale at the local American Legion. We bought all kinds of stuff that they were thrilled to see walk out the door. We didn't even know we had bought the bag of 2 1/2 inch squares but we did. 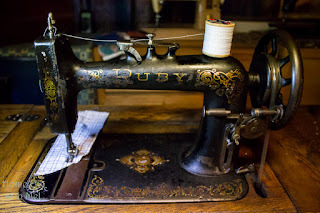 Then my husband got a new treadle and he wanted to make something on it. So he laid it out and sewed up the little top. Then we found out we were going to be grandparents. Somewhere between the finish of the little quilt top and finding out we would be having a grandbaby we got my great-grandmother's sewing machine. So when the announcement came he knew what he wanted to do but he waited until we knew if it was a boy or a girl. It is a boy! So he was looking for a boyish fabric for the back. I just happened to have the baseball fabric in my stash, so he went with that. 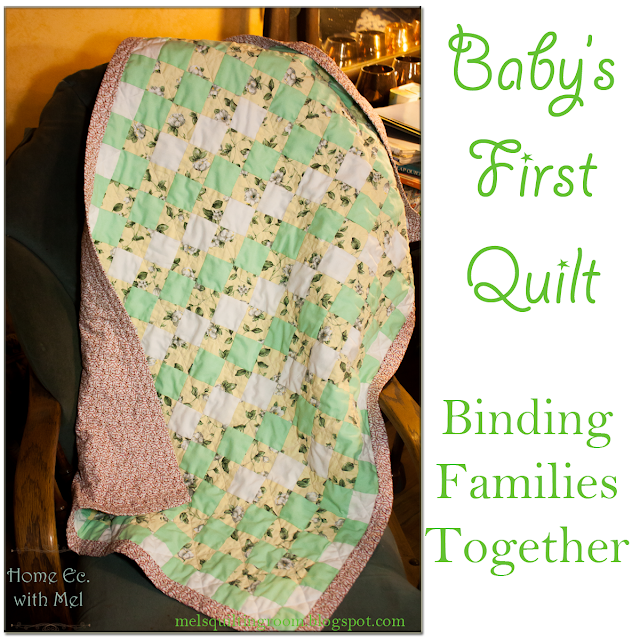 So how does this little quilt bind all the families together? Well this is really kind of fun. The fabric came from the baby's great grand father's (my dad's) American legion post. It was backed with the baby's grandma's (me!) fabric. 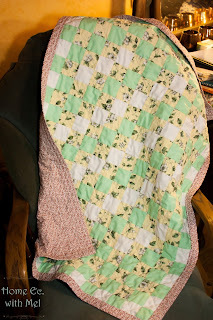 It was quilted on the baby's great, great, great-grandmother's (my great grandma) machine. It was bound the way the baby's great grandma (my mom) bound her quilts. The binding was hand stitched by me. So really my husband got my whole family in that quilt, the one the baby will never know but will pieces of them in the quilt. The rocking chair it is draped on? My dad bought my grandma when she became a great grandma, see she became a great grandma the same way I'm becoming a grandma. I need to put new cushions on it, those are 25 years old and she told me I would need to put new ones on when I became a grandma. I won't until I get to rock my grandbaby in it with those cushions. So this quilt had bound together multiple generations of the baby's family together. 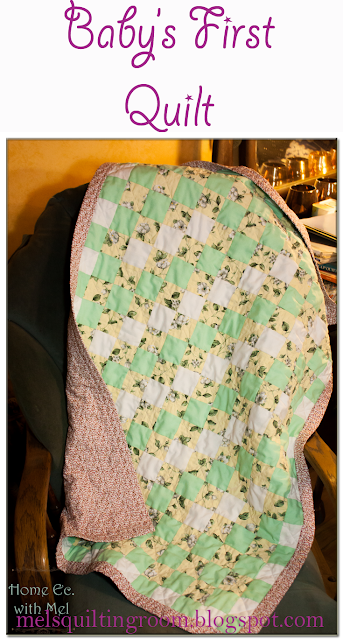 Using a skill that has been passed down through those same generations by my husband, the first quilter in his family. I love this post!! I know you can't fit all that on a label, but do be sure to label it somehow.